Beautiful card. Love the layout. Thanks for sharing and inspiring us. These rich blues really make your card stand out! Gorgeous! The butterfly is colored beautifully! Love the new frame! This is gorgeous, Mel! Really does look like stained glass. Oh my. I love your stained glass image!!! Just perfect. Very pretty card! Love the stained glass looking butterflies. I love the oval with the butterflies - really draws you eye into the color! Lovely! Love your stained glass butterfly! Thanks for the inspiration! Melanie, your card is beautiful, love how you added the butterflies around the frame. Gorgeous coloring of the butterflies! Beautiful cards. And so easily made. Cannot wait for this frame (have most of the others) but this is so versatile. This is soooo awesome Mel! Those butterflies are so stunning and perfect placed! Yes, great minds as they say! LOL! Fun card - in both orientations! So pretty! I like the way you coloured the butterflies. Love the stained glass butterflies! Gorgeous card! Love the frames you added to show up this awesome mini kit! Beautiful butterflies! The rich hues of the butterflies are amazing! Like the stained glass look on the butterfly. Nice new frame. So pretty and that butterfly is perfect! love this design!!! Very lovely card! 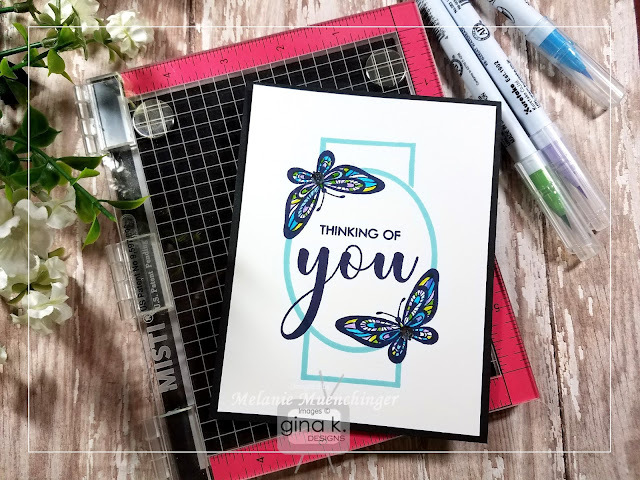 I love the butterfly from the Boho Flowers stamp set. Loved the video. Your little piece of the new set looks wonderful. As all ways you never disappoint me, card us beautiful. Melanie - what a most gorgeous set of cards. Thanks for the awesome video! Love the card in both layouts. The Butterflies has a stain glass look! Lovely!! Hmmm, this frame looks like it will definitely be a fun one. Great work with the butterflies. Fantastic card! incredible design and colors! I love how you colored the butterflies, they're so pretty. Thanks for sharing your creativity with us! Beautiful work. I love the butterflies in those colors. I bought my Misti last year and rarely use it. Seeing everyone here using the Misti I will be using it on a daily basis. Love all your cards and designs. Love the clean crisp look. Love these butterfflies and the simple design. Love both equally. I look forward to getting the stamp label. That will be used often as well as the white dots to color. Fantastic ideas in this video. Such a sweet card - so simple and elegant! Ooh so pretty. I love the sneak peek of the new set. I'll visit later to view the video. Great cards...like both layouts...could not pick one. Can't wait to see the new stamp set!! I love that you show that single layer cards can be really beautiful! Great tutorial and a lovely card. many thanks for sharing so much of your talent. Very pretty. I like the landscape version. I also like how you added dots to the You. Love the simple but elegant look on your card. Thanks for the tutorial, also. Love this pretty card. Great design. I think I like the landscape best. Both are very pretty! Congrats on your new release!! Love the colors of your butterflies. Thank you for the video. I love your card. I love anything butterfly and these are absolutely gorgeous. Beautiful card. Great card, great video! Love the new frame! Thanks for sharing! I like the simplicity of your beautiful card. Beautiful card - gorgeous butterflies! I like the portrait best, probably because it is on a black card base and I love high contrast. Beautiful card. The butterflies remind me of stained glass. Great card and video. Especially like the butterflies!! Love the tutorial, already thinking about what I can do with all the information. The card really highlights those beautiful butterflies and sentiment. Misti really made the card easy to enhance. Sweet card looks like stained glass. Wonderful card. Thank you for sharing. Lovely card Melanie, the butterfly is so pretty and your tag stamp so versitile! Beautiful card - love your colors! I just love this card, Melanie! Can't wait to get my hands on the label stamp set and the die sets as well! Love the colors in this butterfly! Happy! Gorgeous and a sneak peek, too. WOW. I have all of your frame sets, this gives me moore ideas Jon how to use them! Such a beautiful card, Melanie, and yet another of your gorgeous sets I just can't wait to own! Thanks for sharing! Beautiful sat of stamps. Your card is fantastic. The basic idea for this card can be used for many types of cards. One could make a set without a lot work. I like both cards, but the one with the black layer really makes the blue color pop! 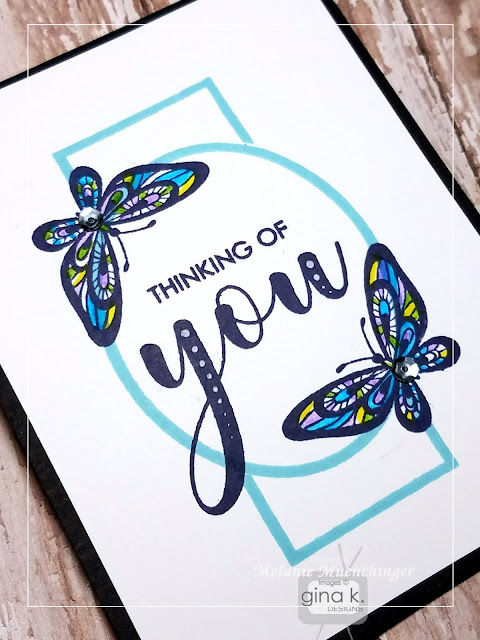 Love the butterflies on your card. A difficult choice between the portrait and landscape orientation but for me, the landscape has a slight edge over the portrait. Both are lovely. such a pretty card, I love both versions!!!! I love how you used the Boho butterflies to your frame. Thanks so much for all the tips. As always, beautiful. 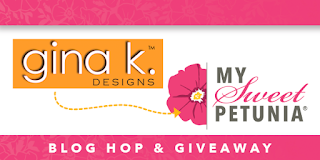 I love your designs. Thanks for all of the tips. Beautiful card and I can't choose. Thank you for sharing. I love the layering! Thanks for the inspiration! Simple design but so pretty. I like how you angled those butterflies and nice use of the frame. oooo! Those butterflies look fabulous with that label frame!! Pretty cards. I liked both orientations, so that label is very versatile! Love seeing more ideas for same stamp sets. And how to mix and match. Like it both portrait and landacape. First time seeing the MISTI stamp. LOVE IT, you make it look so easy when you do cards. Beautiful card; I love the elegant simplicity of your design and construction. This has been a great blog hop with so many cool contributions. TFS!